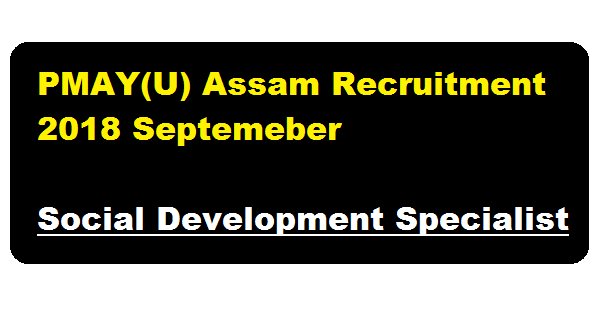 In this section, we will discuss in detail about Recruitment of Social Development Specialist post under Pradhan Mantri Awas Yojana – Urban, Assam. i) Candidates must have done Master’s degree in Social Science/Sociology/Development Studies. ii) Candidates also have 5-7 years of work experience in social and community development. iii) Experience of working in the development areas, preferably with urban community and slums. iv) Knowledge and experience in participatory planning and community mobilization. v) Fluency in local language is essential. Remuneration: Rs. 85,000/- per month inclusive of all emoluments. a) Only shortlisted candidates will be called for Interview or/and Written Test for which no TA/DA will be paid. b)List of shorbSted candidates will be published in the website http://pmayassam.in before the interview. c) No call letters will be sent for attending the Interview or/and Written Test. d) The candidates should report for Interview or/And Written Test at the scheduled Date/ Time and Venue which will be intimated in this website. e) The candidates should regularly check this website for further information. f) The candidates should bring their original document/certificate at the time of Interview or/and Written Test for verification. g) Preference will be given to candidates with similar experience in Govt. Sector. h) The undersigned reserve the right to reject any or all applications without assigning any reasons thereof.